In some accounts, the Alaskan Malamute is described as a descendant of dogs of the Mahlemut (now known as Kuuvangmiut or more commonly Kobuk) group of Inupiat in upper western Alaska. These dogs had a prominent role with their human companions - as a utilitarian dog, working, hunting, and living alongside humans. The dogs were renowned for their excellent hunting abilities and were used to hunt large predators such as bears. They also aided their owners in finding seals by alerting to seal blow holes. The interdependent relationship between the Mahlemut and their dogs fostered prosperity among both and enabled them to flourish in the inhospitable land above the Arctic Circle. For a brief period during the Klondike Gold Rush of 1896, the Malamute and other sled dogs became extremely valuable to recently landed prospectors and settlers, and were frequently crossbred with imported breeds. 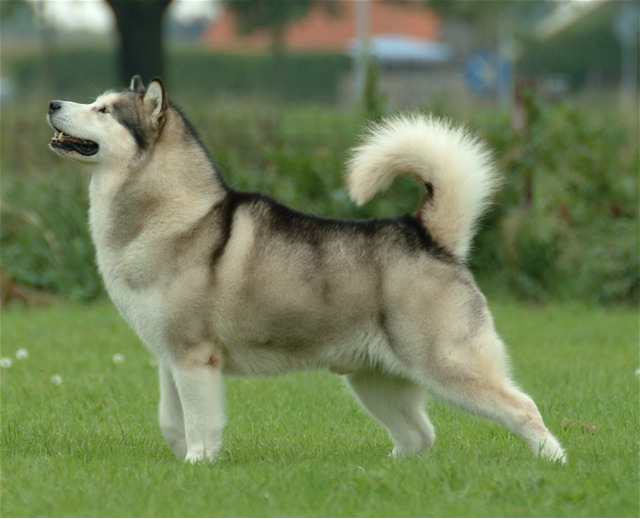 This was often an attempt to improve the type, or to make up for how few true Malamutes were available to purchase. This seems to have had no long-standing effect on the modern Malamute, and 2004 DNA analysis shows that Malamutes are one of the oldest breeds of dog, genetically distinct from other dog breeds. A study in 2013 showed that the Alaskan Malamute has a similar east Asian origin to, but is not clearly related to, the Greenland Dog and the Inuit Sled Dog (Canadian Eskimo Dog), but contains a possible admixture of the Siberian Husky.